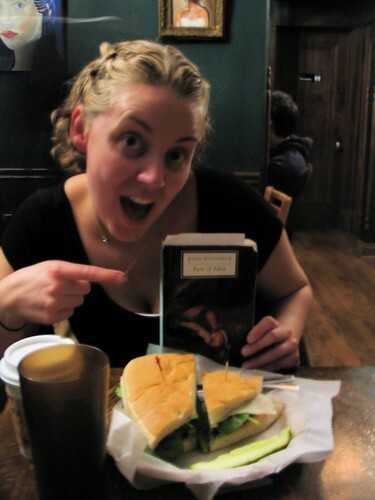 As promised, my two-person book club met up at the Bourgeois Pig last week for some serious Steinbeck dissection. Ms. Kasey and I knew we had truly chosen the right locale for our meeting when we found an "East of Eden" sandwich on the menu board. We of course had to order one (as seen above) and I nabbed a chicken sandwich to satiate any meat-eating needs for the evening. Though the "Eden" sandwich was quite the veggi delight with avocados, mushroom that tasted like chicken and lots of leafy greens. We actually discussed the book for at least a half and hour to 45 minutes, not bad for book-club beginners, before we descended into letting the brunette with the laptop at the next table learn much too much about our personal lives. I love - love - Steinbeck. In high school and college I had a tiny Mitsubishi pickup truck I named Rocinante in honor of Steinbeck's truck from Travels with Charley, a truck that my parents took a special trip to Salinas to so I could see the real thing. My Rocinante is currently living his third incarnation with some family friends on Mt. Veeder, having survived several trips to Oregon and a run-in with some overnight hit-and-runners in Santa Cruz. I grew up in the Bay Area, so the worlds of Steinbeck's novels are something familiar and dear to me. His writing is honest and he is fair man who gives the bum and rich man equal dignity, with perhaps more dignity to the bum. My two favorite Steinbeck works are the aforementioned Travels with Charley and East of Eden. Charley is a love letter to America - a kind-hearted real-life roadtrip filled with the beauty of the America landscape and the kindness of strangers. Eden dances on the boundary of fiction and non-fiction: the Trasks and the Hamiltons are real people, with a very young Steinbeck even making an appearance. But beyond these family trees, what is really true? Invented or not, the epic of these families is both touching and painful. Most of our discussion on Thursday focused on the familial relationships: sibling rivalries, the love of between parent and child - how our own lives intersect and different from the Hamiltons and the Trasks. Intersections, I'm sure, even the brunette with the laptop would understand. PS: We're currently looking for our next book selection: preferably something classic, wintery and shorter than Eden. If I hadn't just read Call of the Wild it would have been perfect. I'm thinking maybe Ethan Frome? I'd love to hear any suggestions!